manufactures with a maximum diameter of 350 mm and maximum length of 550 mm. We have been emerged as one of the leading organizations that are offering a best quality range of Horizontal Lathe Machine. 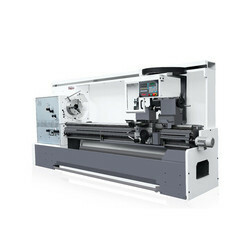 This Horizontal Lathe Machine is manufactured in compliance with set market quality standards. We offer these products in different specifications at industry leading prices. Founded in 1969, Hankook Machine Tools Co., Ltd. is a specialist manufacturer of high technology CNC metalworking machine tools located in Changwon – Korea. The company currently employs 150 people and supplies its products to over 70 countries worldwide. We offer Heavy Duty / Extra Heavy Duty / Extreme Heavy Duty Horizontal Conventional / CNC Lathes from Reputed Manufacturers across the world. 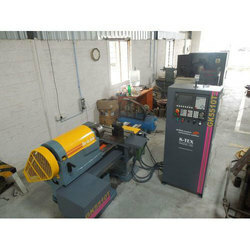 - Height of Centres upto 2500 mm. - Admit between Centres upto 16000 mm. - Spindle Bore upto 750 mm.